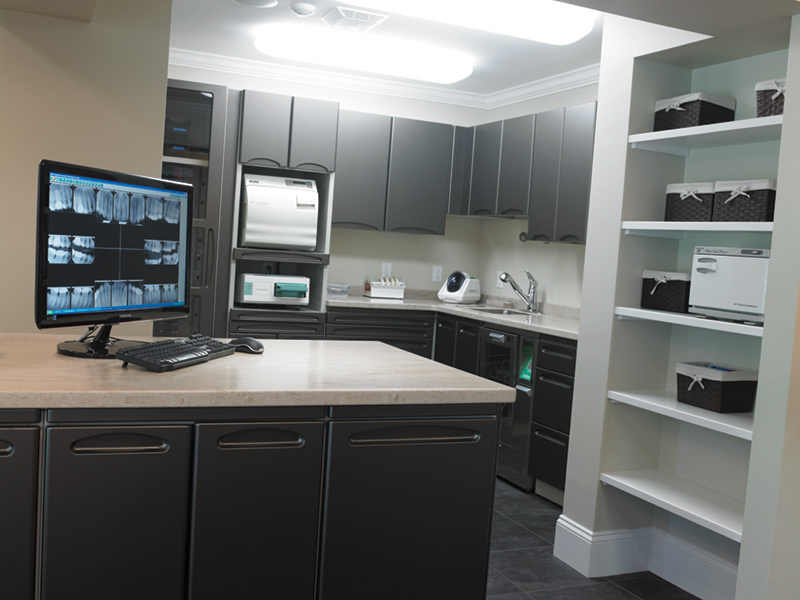 The office workflow is enhanced with a centrally located sterilization area that is open to the operatories. 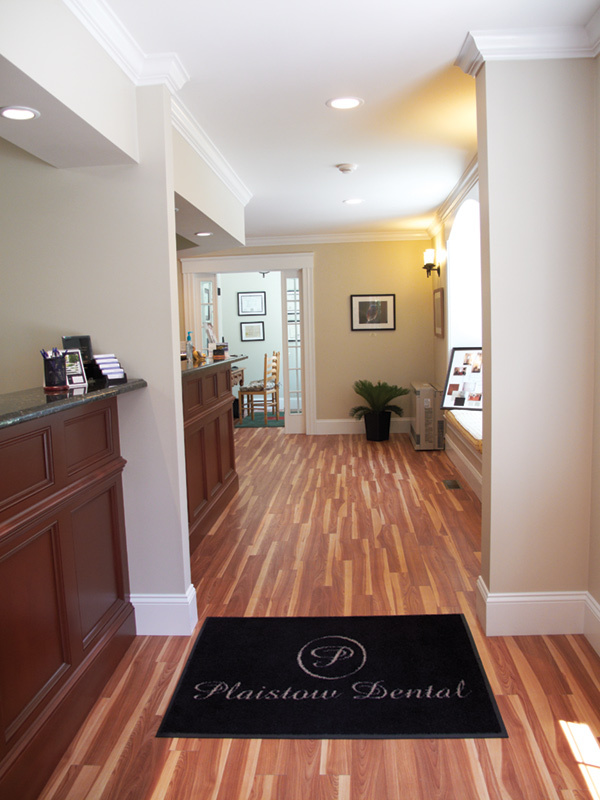 The Plaistow Dental practice building has a rich history. 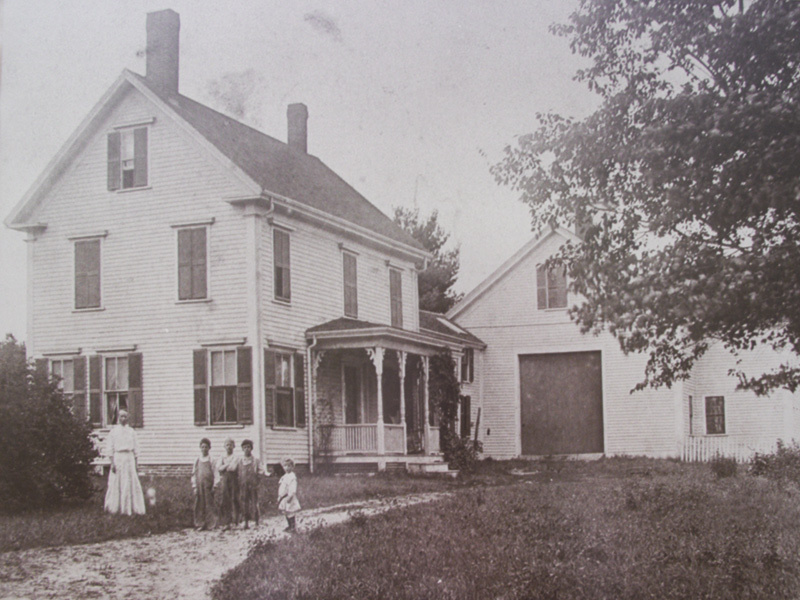 It began as an authentic New England style 1860s farmhouse, built in the typical L-shaped style, in which the barn was attached to the home through a breezeway that protected the owners from going outside into the brutal Northeastern winters. Beginning in the 1970s, this farmhouse underwent a series of renovations that would convert it from a working farm into a successful dental practice. Even though the changes inside the building are dramatic, the bones of the structure remain intact and the design and architecture have preserved the character of this historical and beautiful building. Plaistow, New Hampshire is an idyllic town with history that dates back to colonial times. Dr. Ronald Holiman moved his family to this close-knit community of just over 7,600 residents in 1992, after a five-year stint as a missionary dentist in Hong Kong, and he purchased the property and general dentistry practice from Dr. Albert Landa. The seven operatories are optimally sized for ergonomics, patient comfort, and efficiency. The practice definitely embraced its rural character and still displayed the feeding troughs and hay feeders from its farm days! The attached residence provided an ideal situation in which to raise children while trying to grow the dental practice. In 1998, Dr. Holiman completed a major renovation of both the house and the practice to bring them up to modern standards. However, some aspects of the office were still challenging. The existing operatories in the barn were inefficiently sized and oddly shaped, and the barn floor was uneven, so handicapped patients had difficulty getting around. Overall, because of the tight space, Dr. Holiman was limited in the equipment and services he could offer to patients. When he decided to add another doctor to the practice, the space became even more crowded. The office workflow is designed to maximize efficiency, offering a separate entrance and exit for patients, and greater privacy for conversations between patients and the front desk staff. 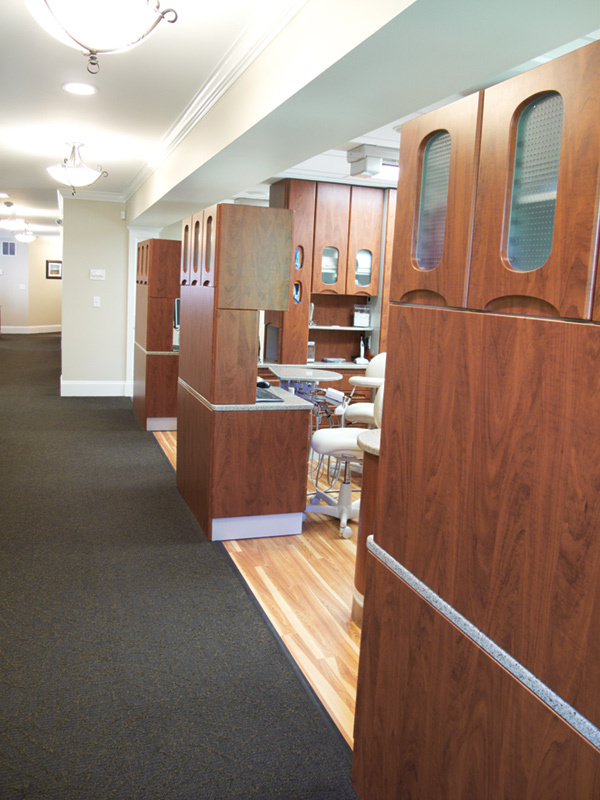 Every room in the practice seamlessly integrates style and technology. Equipped with Dentrix Practice Management Software. 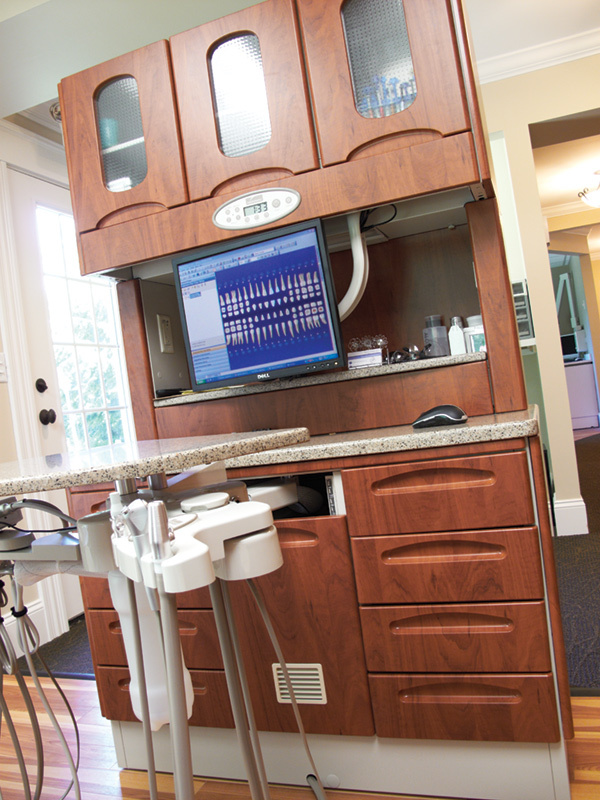 The doctor made a strategic decision – to convert the family’s residence into additional square footage for the dental practice so he could increase the number of operatories and work comfortably with additional doctors and staff. He had both long and short-term goals… he wanted to begin the transition to retirement by adding space to accommodate additional doctors, including his son-in-law who had just come aboard and his daughter who would graduate in several years and join the office. Plus, the doctor saw a need to address the problems within the practice that were keeping him from utilizing the most current technology and equipment that was best for his patients. Because his grown children were now out of the house, it made the decision easier to build a new home and move out of the farmhouse, too, so the practice could expand. The first architect Dr. Holiman contacted suggested a teardown to make way for a new building. But with its rich history, destroying the building was simply not an option the doctor considered. 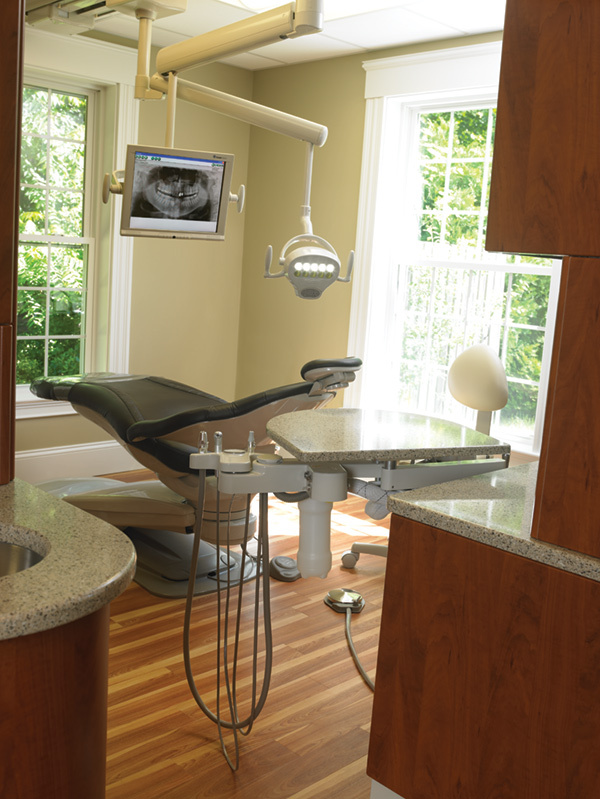 The idea was to maintain the charm and integrity of this home that had been standing in Plaistow for more than 150 years, while bringing it up to the latest best practices and cutting edge equipment available in dental health. While attending a Camlog implant course, Dr. Holiman was introduced to Henry Schein Equipment Sales Specialist Jimmie Hammon, who is also trained as an architect. Where the previous consultant saw a teardown, Jimmie saw the building’s design potential – and had ideas on how to make the existing plans even better. Hammon had experience as a general contractor himself, background that proved to be integral to the office renovation. “Jimmie was amazing to work with, with clear vision of what this building could provide in terms of efficient work space,” said Dr. Holiman. So began the partnership between Dr. Holiman, Hammon, Henry Schein’s National Design team, and Henry Schein Financial Services, which provided funding for the project. 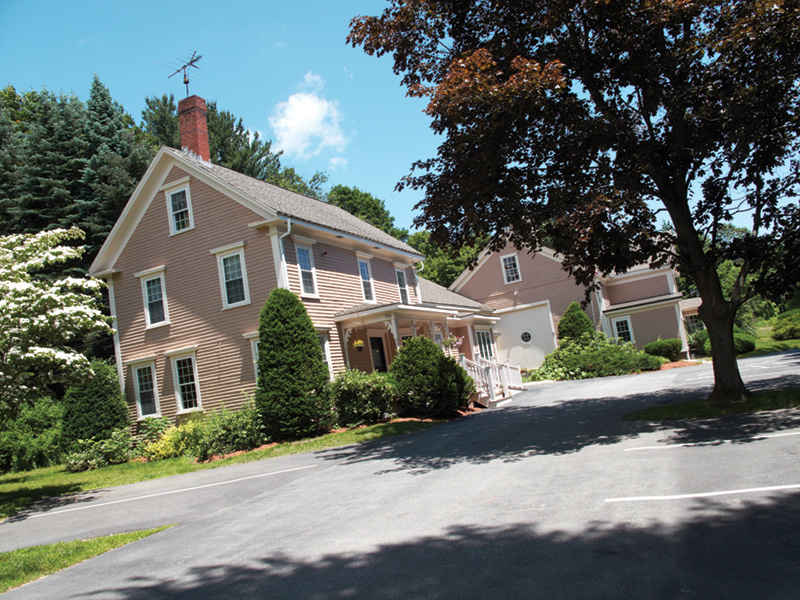 The 1860s farmhouse has maintained its rich historic character through a number of major renovations. Today, the 3,200-square-foot office showcases its past alongside modern technology and equipment. Soothing beige walls are framed by oversized white crown molding that closely replicates the building’s original millwork. Large windows draw in natural light. 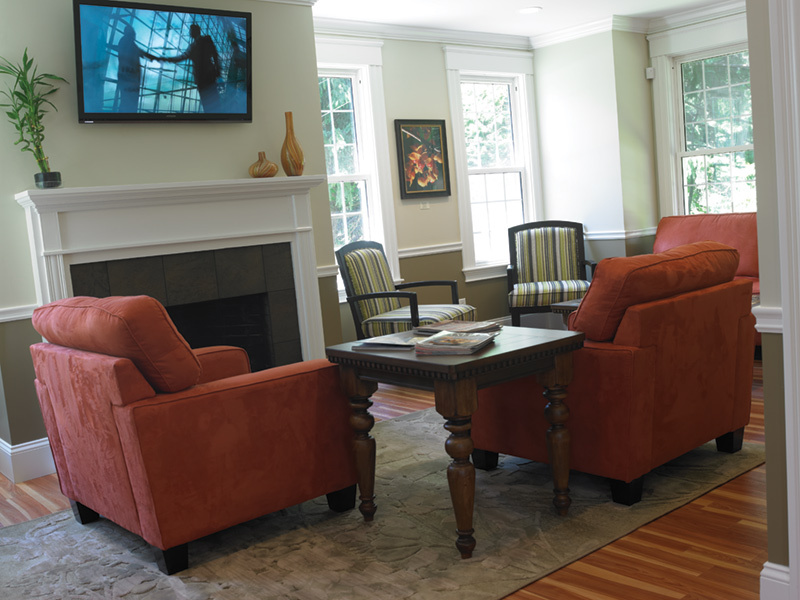 Patients don’t feel like they’re in a dental office; the waiting area looks more like a home, with a fireplace at its center and comfortable sofas and chairs in a soft salmon fabric. The office workflow is designed to maximize efficiency, offering a separate entrance and exit for patients, and greater privacy for conversations between patients and the front desk staff. As visitors enter the clinical area, technology takes center stage. a visit to the Midmark factory with Hammon, Dr. Holiman selected top-of-the-line operatory chairs, cabinetry and lighting for his practice. Patients particularly appreciate the ability to relax in the luxurious massaging heated chairs on cold New England days and look outdoors through the large windows that were strategically placed in every operatory. The expansion into the farmhouse allowed for installation of the Instrumentarium OP300. Something most patients won’t notice is the doctor and his staff also switched from over-the-patient delivery, which they had used for years, to a rear delivery system. Dr. Holiman admits that it was a challenging adjustment that took some time for everyone to master, but the benefits were worth it. Rear delivery reduces physical strain on the staff, and it’s better for patients because it keeps the operatory equipment out of their line of sight, which reduces stress. The renovations also allowed the doctor to offer services he simply couldn’t in his previously cramped space. 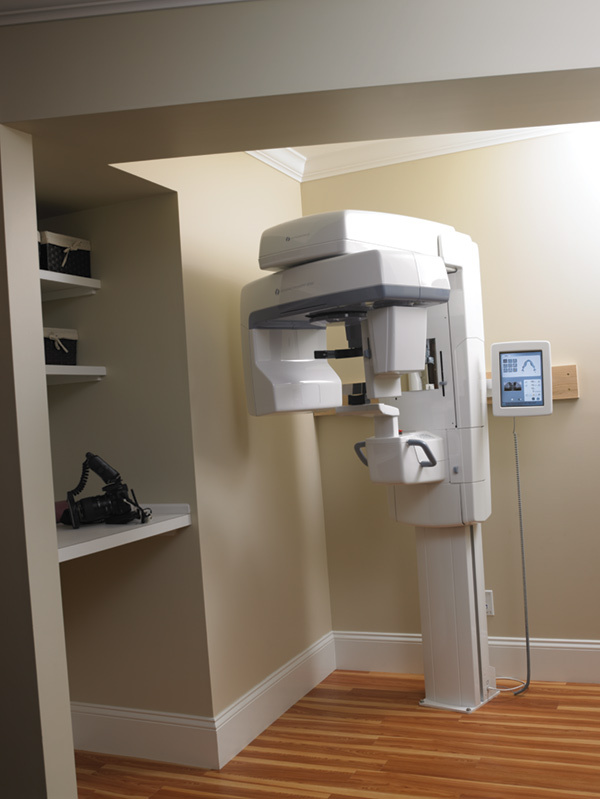 Already a DEXIS sensor user, Plaistow Dental expanded its digital radiography footprint to include an Instrumentarium OP300 digital pan. More reminiscent of a parlor than a waiting area, patients enjoy a comfortable and inviting ambiance. The separate check-in and check-out areas maintain a smooth workflow and allow for greater patient privacy. 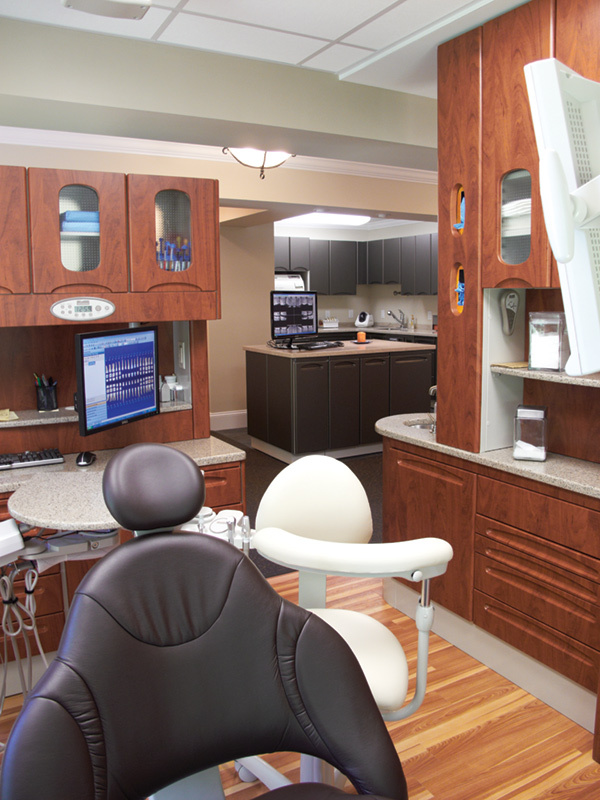 The doctor had been a Henry Schein TechCentral client for some time, and had switched his practice management solution to Dentrix prior to the renovation. As part of the project, he upgraded the hardware, including a new server, workstation computers, as well as software. 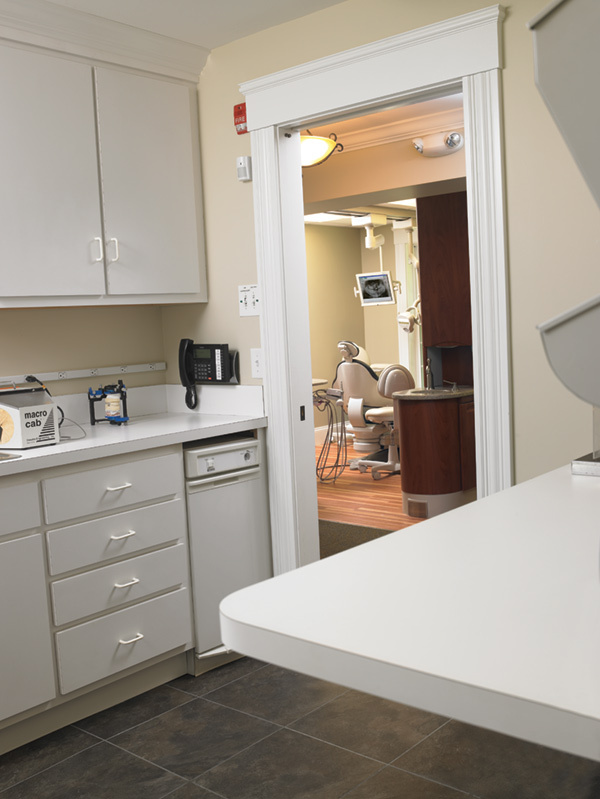 This extensive renovation was a huge undertaking, but it has paid dividends in staff morale, patient comfort, and more practically, in referrals and new business. Patient comfort is optimized in the bright operatories that feature luxurious heated chairs appreciated on cold Northeastern days. Equipped with Midmark chairs, lights, and cabinets. Although the doctor was committed to preserving the historic beauty of this building’s storied past when he constructed the new office, his eye was firmly on the future, too, making certain that after the office was complete, it would offer state-of-the-art care and be spacious enough to grow, long after he retired. 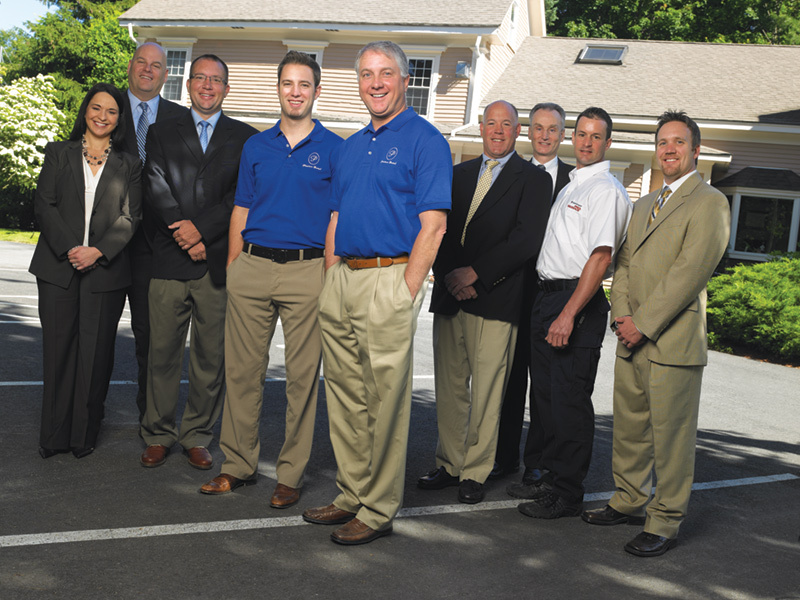 Henry Schein team members from across the company worked collaboratively to provide the doctor with a seamless experience, whether it was in design, equipment selection, financing, or technical support. The open concept sterilization center is clean, efficiently designed, and equipped with Midmark and SciCan. The separate lab room is across the hall from the treatment area.